Smith and Seahawks coach Pete Carroll had a long association that dated to 1982. The Houston Texans on Tuesday announced they have hired longtime Seahawks assistant Carl Smith as quarterbacks coach, leaving just eight assistants remaining on Seattle’s staff of the 24 from the year the team won the Super Bowl following the 2013 season. Smith had been Seattle’s quarterbacks coach from 2011 to 2017 before moving into a role last season as associate head coach. In Houston, Smith will not only get to work with Texans’ third-year quarterback Deshaun Watson but also with his son, Tracy, who is Houston’s assistant special teams coordinator. Smith had the longest coaching association with Pete Carroll of anyone on the Seattle staff, the two having first worked together in 1982 at North Carolina State where Carroll was the defensive coordinator and Smith the offensive coordinator. Smith, who will turn 71 on April 26, later was an assistant under Carroll with the New England Patriots from 1997-99 and again at USC in 2004. Smith became Seattle’s QBs coach in 2011, a year before the arrival of Russell Wilson, replacing Jedd Fisch, who left to become the offensive coordinator at Miami. Wilson and Smith developed a tight bond — Wilson almost always used the affectionate nickname “Tater” when referring to Smith in sessions with the media. 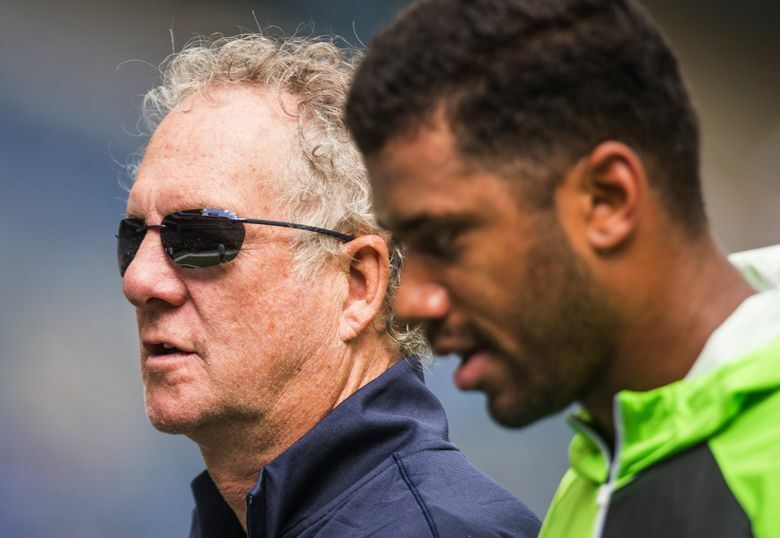 Smith was moved out of the QB coach role last year when Carroll reorganized the offensive coaching staff in the wake of the firing of offensive coordinator Darrell Bevell. Dave Canales, who had been receivers coach, took over as QBs coach. Smith, whom it was known Wilson hoped would stay in the organization, was then moved into an associate head coach role. However, new offensive coordinator Brian Schottenheimer is in charge of the quarterbacks, essentially serving as the coach of that position group, as well, if not holding the actual title. The eight assistants who remain on the staff from the Super Bowl winning team are: Canales, receivers coach Nate Carroll, linebackers coach John Glenn, tight ends coach Pat McPherson, assistant offensive line coach Pat Ruel, special teams coach Brian Schneider and secondary coach Nick Sorensen. The Texans hired Smith as part of a revamping of their coaching staff. Houston had not had an offensive coordinator the past two years but will have one now, with Tim Kelly coming on as OC. Smith also gets to work with Watson, who last year led the Texans to an 11-5 record and the division title in the AFC South before losing a home playoff game to the Colts.